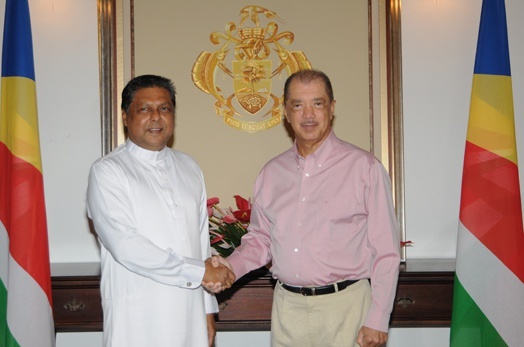 The first resident High Commissioner of Sri Lanka to Seychelles, HE. Rajatha Piyatissa, presented his credentials to President James Michel at State House this morning. Following the ceremony, High Commissioner Piyatissa told the national media that he is ready for the challenge ahead, one that has been paved based on the 'good and wonderful relations' that exist between President James Michel and President Mahinda Rajapaksa.He also spoke about the areas of cooperation that he will be focusing on which he said would be beneficial for both Seychelles and Sri Lanka, especially in trade and investment areas. “Sri Lanka and Seychelles are both two island nations and there’s so much to give for both countries…it’s a win-win situation, two countries, two island nations with a lot of resources. ...we have signed agreements and with my mission being here now and Seychelles is planning to have mission in Sri Lanka very soon, so I think in a short period, everything will bear fruits. I see a very strong and great future for both countries. I see a lot of trade relations we can have, because Seychelles has a lot of resources and some of them are not being fully utilised. Sri Lanka has the expertise especially when it comes to coconut, cinnamon and in tourism industry. So our expertise and with our resources, together will be beneficial for our countries,” said High Commissioner Piyatissa. Also present during the meeting were the Principal Secretary of the Ministry of Foreign Affairs, Ambassador Maurice Loustau-Lalanne, the President's Diplomatic Adviser, Ambassador Callixte D'Offay, Attaché to the High Commissioner, Mr. Mohamed Hilmi Ismail Segli and the Honorary Consul of Sri Lanka to Seychelles, Mr. Erol Roy Fonseka.